These devices have Keyholders everywhere flipping the bird at their slaves! 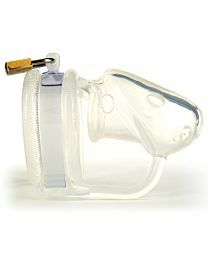 Birdlocked has completely revolutionised the look and feel of chastity devices with its unique appearance and one piece manufacture. The distinctive design is completely unrivalled when it comes to hygiene and comfort, and available in a variety of different sizes there is something for every man in the UberKinky Birdlocked collection. Light, durable and non-invasive, Birdlocked devices can be worn discreetly underneath clothing. They are crafted using only the finest surgical silicone and each device comes complete with a rust-proof padlock and two keys. The one piece design means that there is no sheath ring assembly and devices are perfectly contoured to the male form. You’re sure to be flying high, but we guarantee there’ll be no hope of an escape from a cage this secure.